My Grandparents called this “drawing salve” or “black salve.” If you got a splinter, thorn, insect stinger or tiny piece of glass embedded in your skin, they would apply this salve and cover it with gauze. They’d repeat the process each day until the splinter or thorn swelled up to a head and popped out.My cousins all have a glass jar of this wonderful salve as do I and all of my gardening friends. I think country families all had their own recipe for this salve with different variations. The version my grandparents used had activated charcoal powder, pine tar, beeswax, clay, olive oil, honey and other ingredients. It was thick, black and stinky but it worked! I’ve seen other recipes where the olive oil is infused with herbs like plantain or calendula in order to add the healing properties of the herbs. Thos recipes are probably more effective if you’re trying to draw out venom or poisons rather than splinters. An herbally infused salve would also be better for treating boils. 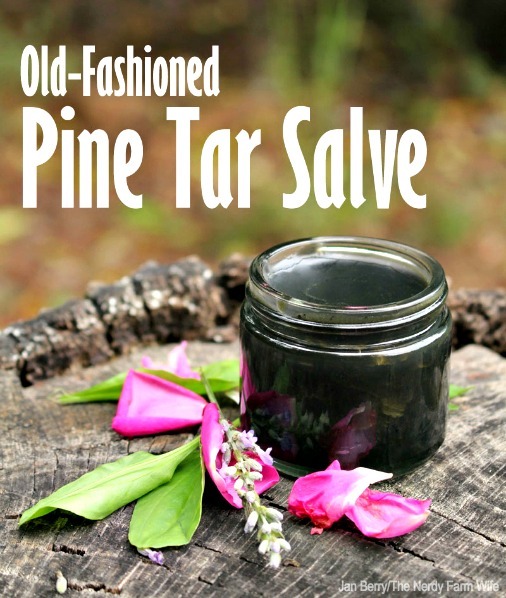 Some recipes for Black Drawing Salve exclude the pine tar altogether. If you do include pine tar, one explanation of the healing mechanism is that pine stimulates local blood flow and significantly increases the immune response where the salve has been applied. So the area becomes inflamed until the body rejects the splinter, thorn, glass etc. Jan’s recipe uses a light oil like olive oil, infused with plantain or calendula. She also uses pine tar, beeswax and one other ingredient. She explains how to infuse the oil and mix the ingredients into a balm. Store in a glass jar and use as directed. Calendula has been used for centuries to heal wounds and skin irritations. It has anti-inflammatory, astringent and disinfecting properties.